It seems obvious to use a thermostat for this over temperature alarm circuit. 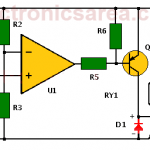 We make the clarification because they also can use other devices such as thermistors, diodes, etc. 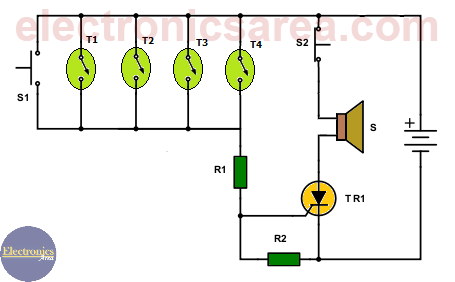 This over temperature alarm circuit can be assembled easily, due to the small number of components required. 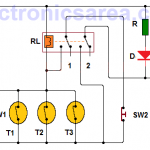 How the over temperature alarm circuit works? For the over temperature alarm circuit operation, a thermostat is used. This thermostat is activated at a temperature defined by the model itself. The bimetallic thermostat closes and opens its terminals depending on temperature. When the thermostat closes, it allows current to flow through it. The current lights a LED for visual warning and a buzzer for audible warning. When the thermostat terminals are closed, a current flows through it and turns on an LED for a visual warning and a buzzer for an audible warning. 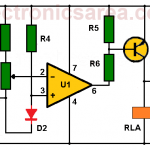 If the sound of a buzzer and the light of the LED are not enough, you can place a relay, with the right features, between the cathode of the LED and the left terminal of the thermostat. So you can activate a siren or bell to call more attention. Thermostat options are: 67L040, 67L045, 67L050, 67L055 67L110 and so on. Very important: place the thermostat as close as possible to the place where you want to sense the temperature.